His daughter Claire arrives believing she’s there to talk with him about putting her Alzheimer’s stricken mother in a nursing facility. Instead, Johnny breaks down and tells Claire: “I killed your mother.” He and Claire argue about when they need to contact Claire’s brother Teddy, who is in line to be the next Chief of Police in town. Johnny believes Teddy can be convinced this was a “Kervorkian thing,” and find a way to clear Johnny of any charges. A disruptive neighbor with a mysterious connection to Johnny's past then intervenes, just before Teddy arrives, leading to a disturbing confrontation. As the play progresses, a number of shocking revelations turn the family upside down. 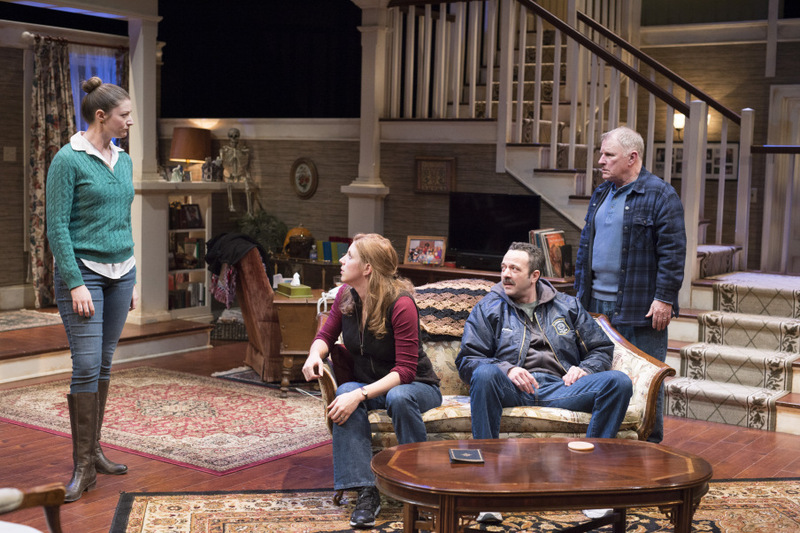 Enthusiastic audience and critical response to the Northern Stage production generated an off-Broadway production at 59E59 Theaters off-Broadway. Both productions were directed by Carol Dunne, and featured Katie Bruestle (at Northern Stage), Jenni Putney, David Mason, Kathy McCafftery (in New York), Emmy Award Winner Gordon Clapp, and Kathy Manfre. "TRICK OR TREAT at 59E59 Theaters is a Must-See dark comedy about family secrets. Get your tickets and see this show that everyone will be talking about!" Broadway World. “TRICK OR TREAT is a domestic horror show. A less skilled playwright might have gone for the obvious and focused on mercy-killing and the ravages of Alzheimer’s. But, with the surprising doings of the second act, Neary takes an unpredictable direction… Family uber alles. Its secrets are supposed to protect, but they always come back with bite, followed by unimagined consequences. Dramatist Arthur Miller said that tragedy was when the chickens come home to roost. And the birds are always in flight — even on Halloween.” ARTSFUSE.